This dish is super easy to make but just a little time consuming due to cooking times but don’t let that scare you away. It makes a beautiful Sunday evening meatless meal, especially in the fall when the squash are in season and at their best. I was able to pick up a lovely lemon yellow spaghetti squash this weekend at my local market and the flesh was thick and very tasty. I also put aside some of the seeds to dry out so I can plant them in the spring. Considering that the meal is cooked and served in its own bowl clean up is a cinch. 13.6g net carbs, 19.3g protein and 15 Weight Watchers points per prepared half. Cut spaghetti squash in half lengthwise and scoop the seeds out. Place cut side down on a baking sheet lined with parchment paper and bake for 40 minutes. In the mean time heat oil in a small frying pan and saute the onion and garlic till translucent but not brown. 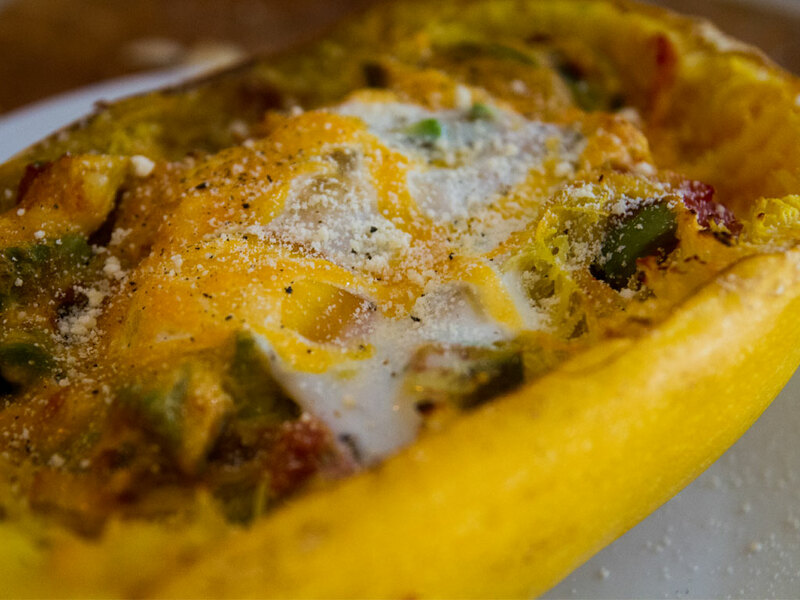 Using a fork, separate spaghetti squash into strands leaving them inside the shells. Add 3 tbsp of salsa and half the parmesan to each half and mix gently with a fork. Top with 1/2 avocado and break 1 egg on top of each shell. Sprinkle the cheddar cheese evenly over each half and bake for 20 - 22 minutes or until the egg whites appear to be set.